The verde.Chain class allows us to created gridders that perform multiple operations on data. Each step in the chain filters the input and passes the result along to the next step. For gridders and trend estimators, filtering means fitting the model and passing along the residuals (input data minus predicted data). When predicting data, the predictions of each step are added together. Other operations, like verde.BlockReduce and verde.BlockMean change the input data values and the coordinates but don’t impact the predictions because they don’t implement the predict method. The Chain class was inspired by the sklearn.pipeline.Pipeline class, which doesn’t serve our purposes because it only affects the feature matrix, not what we would call data (the target vector). 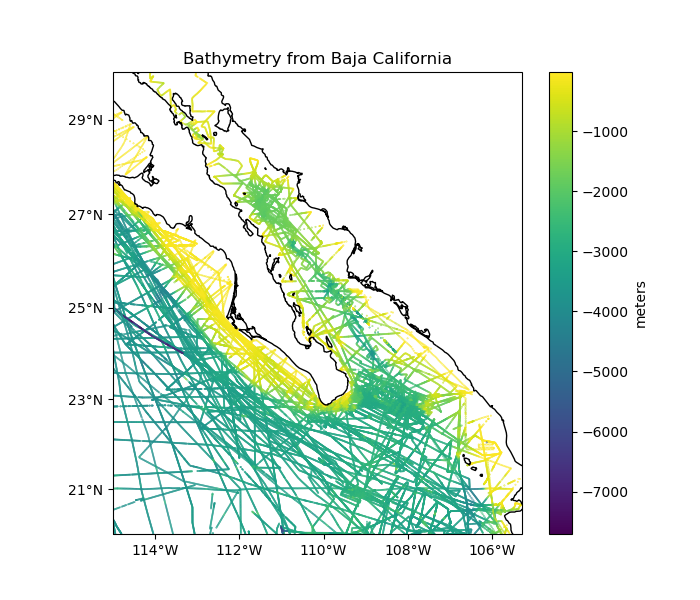 For example, let’s create a pipeline to grid our sample bathymetry data. 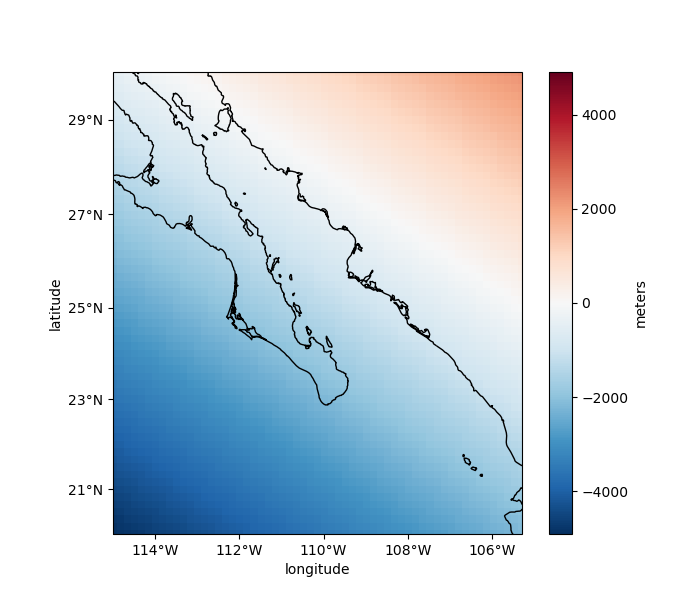 We’ll create a chain that applies a blocked median to the data, fits a polynomial trend, and then fits a standard gridder to the trend residuals. Now that the data has been through the chain, calling verde.Chain.predict will sum the results of every step in the chain that has a predict method. In our case, that will be only the Trend and Spline. 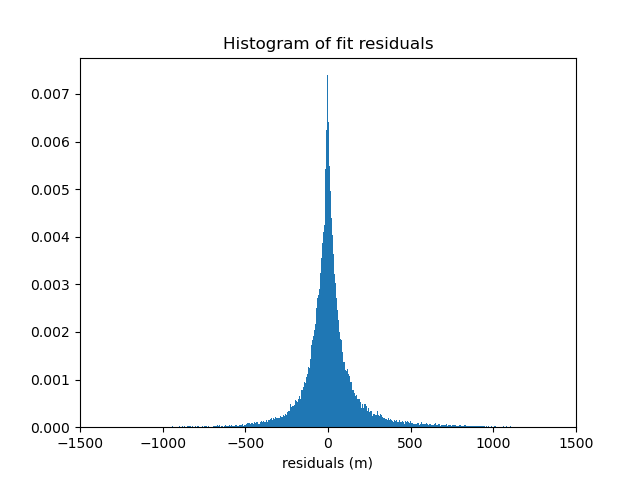 We can verify the quality of the fit by inspecting a histogram of the residuals with respect to the original data. Remember that our spline and trend were fit on decimated data, not the original data, so the fit won’t be perfect. Likewise, verde.Chain.grid creates a grid of the combined trend and spline predictions. This is equivalent to a remove-compute-restore procedure that should be familiar to the geodesists among us. Each component of the chain can be accessed separately using the named_steps attribute. It’s a dictionary with keys and values matching the inputs given to the Chain.